A shield volcano grows as layer after layer erupts from a volcanic pipe or vent. This means that as eruptions pour out lava, each flow will probably flow in a different direction. The result is a volcano that's roughly circular around the vent. But sometimes lava erupts from a fissure (similar to a crack in the surface) that may be several kilometers (miles) long. When that happens, a lot of easy flowing, highly fluid basaltic lava can pour out of the fissure all at once. The resulting flood may cover thousands of square kilometers (miles) with a layer of lava. If activity continues, lava may spill from the fissure several times, building layers on layers. Because the fissure is long and the lava pours out at a high rate, this prevents the eruption from building a large volcano in a single place. Instead, renewed eruptions pour out sheets of lava that cover or "repave" older surfaces much like fresh-poured concrete. Small features such as craters may become buried, while molten rock will flow around the larger and more prominent features, forming an island of older material in the lava flow called a kīpuka. In some cases, the hot lava flow erodes channels into the surface, leaving what looks like a riverbed. Because the lava flood is widespread but thin, its surface cools quickly and grows stiff. (It's like the skin that forms on hot pudding or cocoa.) Under this insulating layer, lava remains hot and can continue to flow. This can cause the hardened surface to crack into rough plates and slabs that move like ice sheets on a river in winter. This process is called rafting. 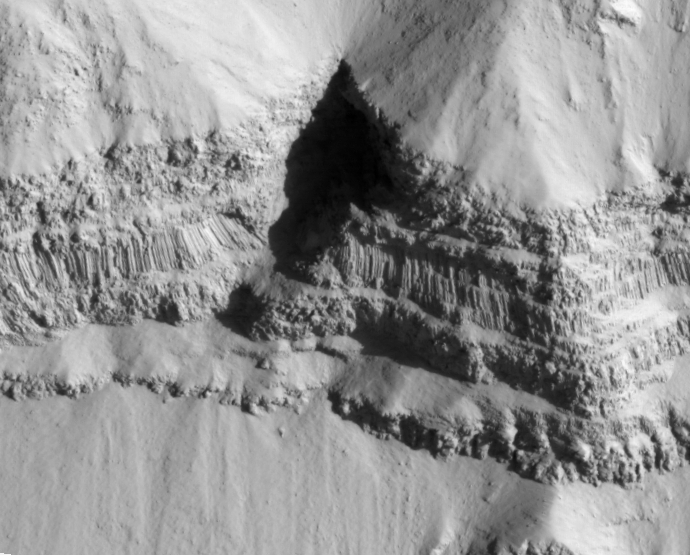 Features like this occur at Cerberus Fossae in Elysium. In some areas of Mars covered deeply with flood basalts, the underlying ground has subsided and compressed. This causes the lava flows to push up what scientists call wrinkle ridges. To see how this works, look at the palm of your hand as you cup it. Notice how the skin buckles into ridges? Lava flows behave in a similar way. In general, wrinkle ridges form a line running at right angles to the direction of compression. Flood basalts also occur on Earth. Notable ones lie along the Columbia River in Washington and Oregon, in central India, and in northwest Siberia. Scientists have identified about 20 major flood basalt areas on Earth.